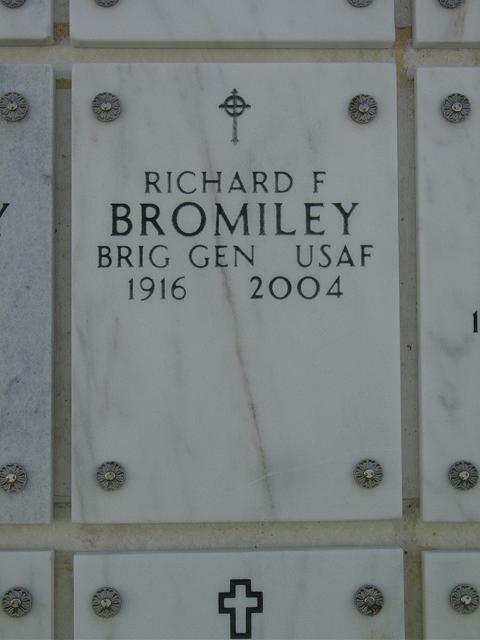 Brigadier General Richard F. Bromiley was assistant deputy chief of staff for materiel, Headquarters Air Defense Command, Ent Air Force Base, Colorado. Appointed in September 1964, he assists the deputy chief of staff for materiel in planning, organizing and controlling ADC materiel resources and developing logistic requirements to support North American Air Defense Command/Continental Air Defense Command/Air Defense Command air defense mission objectives. A native of Philadelphia, Pennsylvania, General Bromiley received his high school education at Frankford High School in Philadelphia. He began his distinguished military career as a graduate of the U.S. Military Academy at West Point in 1938. General Bromiley's first assignment was flying training as a student officer with the Air Corps at Randolph Field, Texas. In November 1939, he received his pilot wings at Kelly Field, Texas. After graduation from Kelly Field, General Bromiley was a flying instructor in the advanced flying School at Kelly Field until late 1940. He was then transferred to assist in the expansion of the Air Training Command Pilot program at Maxwell Field, Alabama. After several other Air Training Command assignments as commanding officer of a training detachment at Ocala Florida, director of flying at Gunter Field Alabama, and director of training at Newport, Arkansas, General Bromiley attended B-17 combat crew training at Lockbourne Army Air Field, Ohio. After a brief assignment in the Second Air Force at Ardmore, Oklahoma, he was ordered overseas to India in January 1944 with the Air Transport Command's Hump operation. Until the end of World War II, General Bromiley held several responsible assignments in the movement of personnel and supplies by air from India to China and the support of the American-Chinese war effort against the Japanese in China. After World War II and return to the United States, General Bromiley had a brief assignment in Air Transport Command Headquarters in Washington, D.C. He attended the first Air Command and Staff School Class at Maxwell Air Force Base Alabama, graduating in 1947. He was reassigned to Air Transport Command Headquarters and actively participated in studies and congressional hearings on the proposed consolidation of the Air Transport Command and the Naval Air Transport Service which became the Military Air Transport Service - MATS - in June 1948. Upon its organization, General Bromiley was given a key assignment in operations. Shortly thereafter, the requirements for the Berlin airlift put great demands on the newly formed MATS for training, aircraft, crew and support personnel so necessary to meet the Berlin airlift requirements. In 1950, while en route to the Air War College, the Korean War broke out. General Bromiley was assigned temporarily to Travis Air Force Base, Calif., to assist in scheduling civilian contract airlift in augmentation of MATS trans-Pacific military airlift in support of United States and allied forces deploying to or engaging in combat in Korea. In September 1950, he was given command of the 1705th Air Transport Wing at McChord Air Force Base, Washington, until mid-1951, when he was transferred to command our national interest base - Kindley Air Force Base in Bermuda. Leaving Kindley in 1953, he attended the National War College. Graduating in 1954, he was assigned to Headquarters U.S. Air Force in the Pentagon and in 1956 was assigned for two years as assistant director, Air Force, of the Joint Strategic Plans Group of the Joint Staff under the Joint Chiefs of Staff. Completing that assignment in 1958, he returned to MATS at Scott Air Force Base, Illinois. He was deputy chief of staff/plans from July 1958, being promoted to Brigadier General in April 1960. In August 1960, General Bromiley was transferred to Headquarters Western Transport Air Force at Travis Air Force Base, California, and assumed the duties of Deputy Commander. In February 1961 he was temporarily assigned as commander, 1501st Air Transport Wing, Travis Air Force Base, and in June 1961 returned to his former position with Headquarters Western Transport Air Force. In February 1963, he was assigned to the newly created U.S. Military Supply Mission India in New Delhi, India. Helping to establish and organize the newborn mission, General Bromiley served as the deputy chief. In September 1964, he assumed the duties as assistant deputy chief of staff/materiel, Headquarters Air Defense Command, Ent Air Force Base, Colorado. His decorations include the Legion of Merit with oak leaf cluster, Bronze Star Medal with two oak leaf clusters, Air Medal, Air Force Commendation Medal and the Army Commendation Medal with two oak leaf clusters. He is a command pilot. Age 88, on February 24, 2004, of Springfield, Virginia. 1938 graduate of US Military Academy. Survivors include his wife, Edith H. Bromiley; three children, Lieutenant Colonel (Ret) William R. Bromiley, Lynne B. Payne, and Joan E. Bromiley; five grandchildren, and seven great grandchildren. Services to be held March 8 at 10 a.m. at Greenspring Village and 3 p.m. Fort Myer followed by interment at Arlington National Cemetery. In lieu of flowers, donations to: Alzheimer's Association or Macular Degeneration Foundation, Inc.